The Soberanía National Park (Parque Nacional Soberanía), near the banks of the Panama Canal in the provinces of Panamá and Colón, some 25 kilometres from Panama City is one of the favorites for birdwatchers, because around 525 bird species are found there. The Chagres River runs through it, which accounts for the amount of wildlife found there. Established as a national park in 1980, the park covers 55,000 acres (220 km2). One of the most famous birding sites is Pipeline Road, which covers 17.5 km north-south through the park and passes through old-growth and secondary forest. 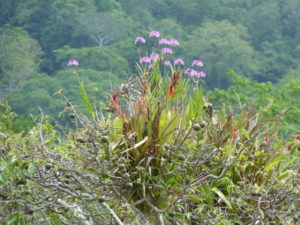 Pipeline Road is one of the best places to see tropical birds in the Americas, with a bird species list exceeding 400. During World War II a pipeline was built along the Panama Canal to transport fuel from one ocean to the other in the event the waterway was attacked. Fortunately, it was never used. The now abandoned gravel road built to maintain the pipeline provides excellent walking access to Soberania’s 22,000 hectares (55,000 acres) of tropical rainforest. The park’s 105 species of mammals include white-faced capuchin monkeys, mantled howler monkeys, Geoffroy’s tamarins, two-toed sloths, three-toed sloths, southern tamanduas, white-nosed coatis, jaguars, agoutis and even deer. Green iguanas are also found in the park. 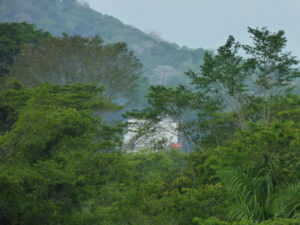 Many of the animals and amphibians that had to be moved during the Panama Canal expansion were relocated to this site. 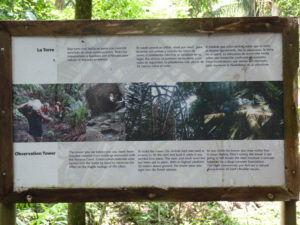 Visitors to the Soberanía National Park can also explore the Las Cruces Trail (Camino de Cruces). This historical trail dates back to the 16th century and was used by the Spanish to transport gold. Parts of the trail are still lined with old stones that once marked the trail’s original path. 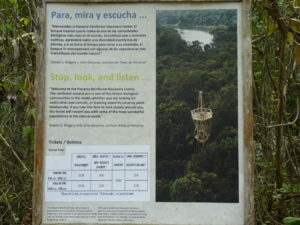 The Pipeline Road: the path is best well known in the park and it is where the Panama Audubon Society carries out its annual bird census. The Plantation Road: this path measures 6.5 kilometers and received its name due to a banana and cocoa plantation operated by the United States government used to be there. El Charco (The Pool) Natural Path: it is the shortest of the paths with a length of 800 meters. It is located over the Gaillard as you walk you can find pools where you can swim. Camino de Cruces (Path of the Cruces): it measures 10 kilometers and is located over the Madden road. During XVI century it was used by the Spaniards to transport merchandise and goods between the Pacific and the Atlantic oceans. 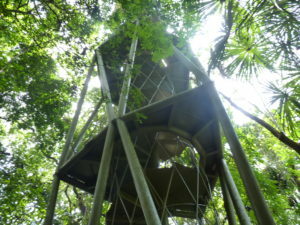 Sendero Espíritu del Bosque (The Holy Spirit Path): it measures 1.7 kilometers and is self guided with 13 stops. 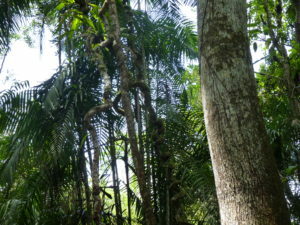 There you can find squirrels, capuchine monkeys, whitetail deer, sloths and birds. Cicloruta: (Bicycle route): it is a special route created for mountain cycling, measures 17.5 kilometers and goes through the Soberania and Las Cruces national parks. Soberanía Park opens Monday to Sunday from 8:30 a.m. to 4:30 p.m. Entrance cost: foreigners $5, nationals $3 students $1 and pensioners $1.50. At the Rainforest Discovery Center you can watch the many hummingbirds visiting the feeders, then climb up the observation tower and enjoy a view over the treetops, possibly with the rather incongruous view of a ship passing on the Canal.